Several steering committee members pose with items going up for bid at the 32nd Annual Bid Around the Maypole, set for Friday, May 4, at the Lakeview Lodge at Treasure Lake. In front from left are: Robin Gill, Marcy Jenkins, Meredith Monteville, Amy Deible and Valerie Armanini. DUBOIS – The 32nd annual Bid Around the Maypole will take place on Friday, May 4, at the Lakeview Lodge at Treasure Lake. According to co-chairs Valerie Armanini and Annette Latuska, the evening begins at 6 p.m. as auction-goers sign in to receive their pre-assigned bid paddles. While browsing the 10 silent auction tables filled with items artfully displayed in the Caribbean Room, auction-goers can enjoy an array of hot and cold hors d’oeuvres and complimentary beverages, spanning two hours when the last silent auction tables close at 8 p.m. prior to the start of the live auction at 8:15 p.m. Attendance is by advanced reservation only. Proceeds from the event support the general operating budget each year with all auction items having been donated by current and former parents, friends, local businesses and school alumni. DCC teacher Carol Korthaus, the auctioneer since the first event in 1987, will signal the start of the Key Club drawing at 8:05 p.m. This year’s Key Club will once again offer 150 numbered keys with five prizes to be awarded: quality wines, a collection of beers, two Dining Around DuBois packages and a Party Basket. The dessert buffet with coffee opens at 7:45 p.m., offering a myriad of sweets throughout the rest of the evening, according to organizer Sharon Gilmore. The Shades of Harmony Quartet will be providing musical entertainment as well as donating their services. The live auction, consisting of 50-plus quality items will be creatively displayed in the upstairs Martinique Room, located on the second floor of the Lakeview Lodge, by Valerie Kness, Rebecca Paisley and Marcy Jenkins, members of the staging committee. Up for live auction bidding are the following: College Grants to four Institutions (Saint Vincent College, Carlow University, Mount Aloysius College and Mercyhurst University) several sets of Steeler tickets, DuBois Dermatology & Cosmetics Services, City Pool package, four Metro Box seats for a Pirates versus Mets Game in New York City, four tickets to Penn State versus Illinois, Milliron & Shaw Eye Care Package, Dessert of the Month, 12 tickets to DelGrosso Park, Beechwoods Golf Outing for four, Fairfield Inn & Suites One Night Stay, Four Lexus Club Seats, Tea Party for 10 at the Maple Shade Mansion, Lancaster Sight & Sound get-away and a Last Supper framed and matted puzzle. Other golf outings from the DuBois Country Club and Treasure Lake will be up for bid, too. Other items up for live-auction bidding are an Autographed Ryan Shazier Football, Sunny Family Fun Package, Handcrafted Oak Bookcase, Bucks Pizza and Wings for 20, Yeti Cooler with Picnic Supplies and a two-night stay at the Omni Bedford Springs Resort. 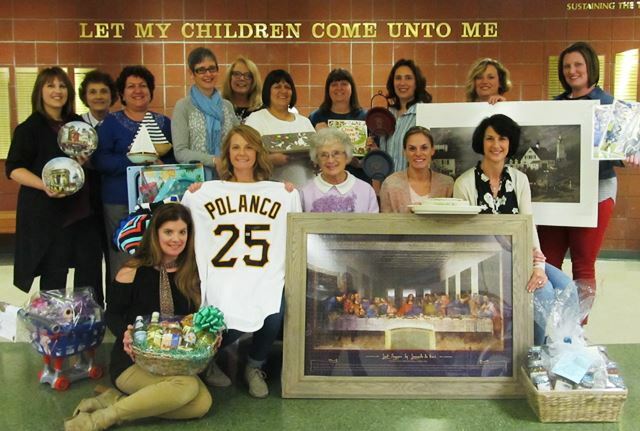 Also up for live-auction bidding are the Suplizio Picnic for 14, woman’s golf clubs, one year Advanced Disposal service, Dining Around Clearfield County package, Geneva on the Lake weekend for two, Lenox Nativity Set, a Gregory Polanco signed jersey, Wustoff Cutlery, Pirate Fan Appreciation packages, Cooper Farm Basket of Canned Goods, Temperware by Lenox, an antique rocker, year of diapers or pull-ups and wipes, to name a few. An array of silent auction items include a truffle compote, Jamaica Basket, glassware and home décor, plus tickets to the Altoona Curve and Erie Sea Wolves, Child’s Cart of Fun, beach themed artwork, assortment of Lenox collectibles, Essential Oils grouping, numerous framed prints and posters, Dean Koontz Inscribed Book, collectible Barbies and college memorabilia galore. Also up for silent auction bid are Angela’s Chocolates and Hockman Candy gift baskets, Christmas Holiday Décor, themed baskets galore, Civil War framed and matted sketches and numerous gift certificates to local restaurants. Chairing the silent auction is Donna Kosko, assisted by her committee of 18 volunteers. Ten tables with 200-plus silent auction items are anticipated. Items are arriving daily at the school, according to Joyce Taylor, school auction liaison. Invitations and reservations for the auction are being handled by Angela Deemer. Treasurer of the auction this year is Belinda Vasbinder, assisted by tellers Marnie Ochs, Susan Williams and Amy Way, along with Teresa Liddle. Organizing the items for check-out will be Michele Burley, Mary Kay Bolam, Renee Gressler, Jocelyn Smrekar, Judy Brosky and Lauren Rice. Students, parents and teachers from elementary through high school are putting together theme baskets that are sure to add excitement to the bidding. Elaine Jacob and Charity Peck are coordinating this effort on the secondary level, with help from Homeroom Basket Moms. Brenda Aravich and Barb Dettore, with help from the elementary teachers and moms, are doing the same on the elementary level. Bobbie Klingensmith and her dedicated crew will manage the sign-in table once again. Angela Edwards and Sharon Gilmore will be responsible for live auction recording. Other key steering committee members are Meredith Monteville, acknowledgments; Michele Burley, business ads for the program booklet; Diane Himes, administrative assistant; Karen Aravich, student coordinator for the drawings; and Joyce Taylor, school liaison for the auction . The Communications Office explains that close to 60 volunteers are needed each year to make the auction a reality. “It is an enormous undertaking spearheaded by parents in support of DuBois Central Catholic,” says Taylor. High school students volunteer their time in numerous ways as well. Tickets for the event are $30 per adult; call Angela Deemer at 814-375-0344 to make a reservation. Deadline is May 3. Call the school’s Communications Office 814-371-3060, ext. 606 for general auction questions.